When there’s a chill in the air and snow is falling in big, fat flakes, we get the urge to warm our bellies with recipes straight out of Alaska. When you’re craving these northern recipes featuring local ingredients, there are a few places to turn. From Anchorage writer Julia O’Malley’s recipe column in the Anchorage Daily News to Kenai’s own Maya Wilson and her cookbook “Alaska from Scratch” and so many more, here are a few of our favorites. Salmon, halibut and crab might be the first ingredients that come to mind when thinking about Alaska, but there are a few more to pay attention to. Think bountiful berry harvests, birch syrup and even game meat! 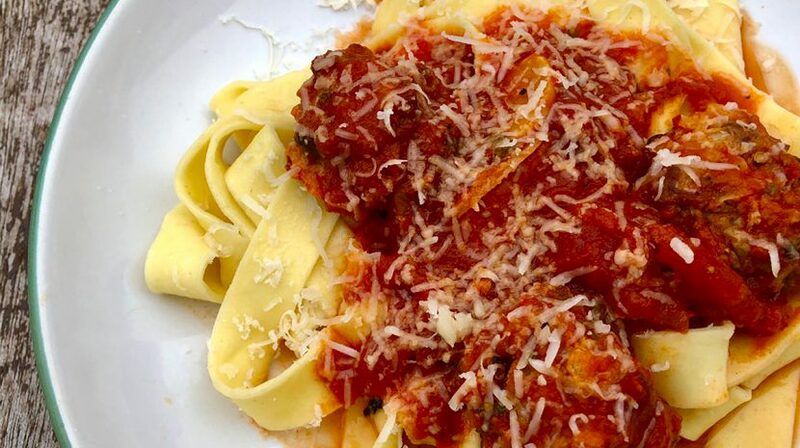 If pasta night is a staple in your household, try pairing with Julia O’Malley’s easy wild game meatballs instead of your standard beef or sausage this week. Once you have your meat of choice, there are only a few ingredients left to gather. Julia’s tips for this recipe include using the old Italian trick of soaking your breadcrumbs in milk, as well as making extra meatballs to freeze and warm up for easy dinners later on. If you love to cook with the flavors of Alaska, we highly recommend adding “Alaska from Scratch” to your cookbook collection. Not only does it feature seasonal and homemade ocean-to-table recipes, but it features beautiful photography that will inspire you to try every recipe. From summer favorites like rhubarb barbecue sauce to the perfect-for-fall Thai curry noodle soup with halibut, it’s hard to pick just one of Maya’s recipes to feature. In this recipe for broiled salmon with birch syrup glaze, two of Alaska’s finest ingredients come together in a perfect marriage creating a salmon fillet that is sure to impress your guests. This recipe is so remarkable your company won’t know just how simple it is with only six ingredients! Wondering what’s for dessert? In the summertime, many Alaskans can harvest enough rhubarb and strawberries to preserve and use for the whole year. Juneau food blogger Sandra Firestack has a recipe for rhubarb n’ strawberry bars that uses either fresh fruit or what you have saved in the freezer (just make sure to drain the liquid first). Can’t get enough? Check out this list of Alaska’s favorite recipes from 2018.